GCU students sort through donated clothes. Many students spend their Saturdays sleeping in, but that wasn’t the case for a group of Grand Canyon University Homeless Ministry student volunteers. 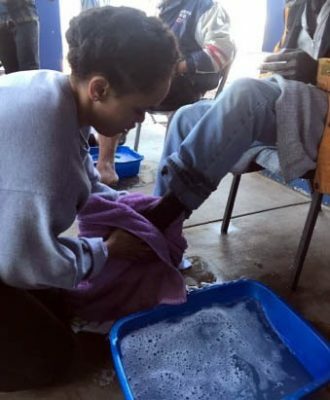 GCU student Nyhla Tolbert washes a woman’s feet. 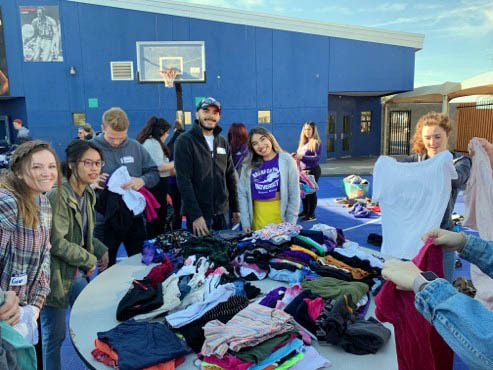 Students, some of whom volunteer weekly with the GCU Homeless Ministry and some of whom were first-time volunteers, ventured out early Saturday to serve the homeless at Phoenix’s St. Vincent de Paul. While the students came from a variety of backgrounds and academic majors, they shared a common desire: to serve others. For several weeks leading up to the service project, GCU students had the opportunity to donate clothing in bins placed in residence hall lobbies. Volunteers sorted through the donations, folded the clothes and distributed the items to homeless individuals. After receiving clothes, the homeless individuals were treated to haircuts, a hot lunch and even feet washing. GCU student Aubrey Grasz prays with a woman before washing her feet. 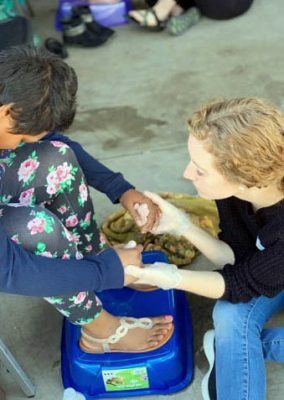 A handful of student volunteers reflected on John 13:1-17, in which Jesus washed His disciples’ feet and then commanded them to go and wash others’ feet. This special act of service was meaningful and humbling for the students. While washing feet, students were able to connect with the individuals on a personal level, hear their stories and pray for them. To get involved with the GCU Homeless Ministry, visit the Local Outreach Ministries office in the GCU Student Life Building. What a great opportunity for GCU students to show the love of Christ to others and fulfill a need. Not only are they providing for those who have a physical need, they are also providing for their spiritual need by just being there, praying for them, and washing their feet. Seeing this makes me wish I was on campus, so I could be involved with this wonderful ministry and outreach too. I have no doubt the work this ministry does touches many lives, some of which the depth may not be known until after the giver is in heaven with Christ.